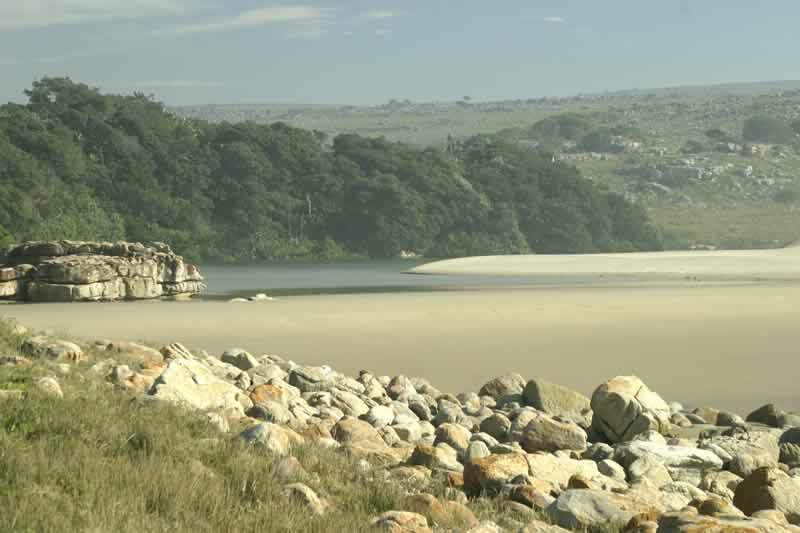 The reserve is situated on the coast of north-eastern Pondoland, in the Eastern Cape. It lies between Port Edward (30 km to the north east) and Port St Johns (59 km to the south west). It is a 7720-ha coastal reserve with open grasslands, dotted with indigenous forest patches and swamp forests, flanked by the magnificent forested ravines of the Msikaba and Mtentu rivers. Grasslands cover a large portion of the reserve and support a fascinating and diverse flora. Large numbers of grazing herbivores such as Eland and Red Hartebeest have been introduced into the grasslands. 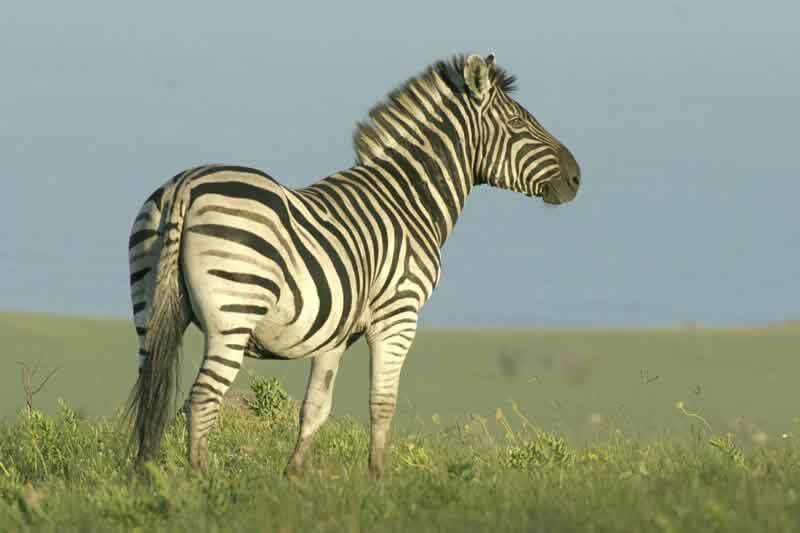 Visitors to the Wild Coast will find the scenic Mkambati Nature Reserve one of the highlights of their trip. 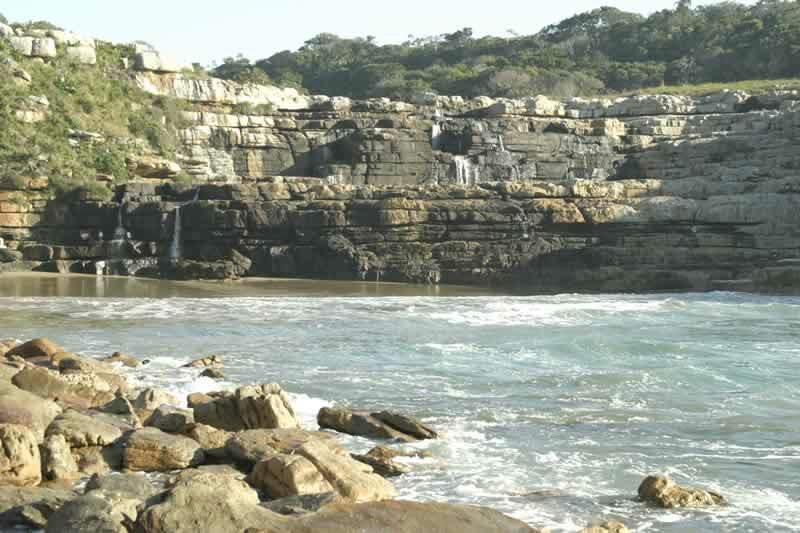 Situated close to the KwaZulu-Natal border, the reserve's coastline stretches along 10km of rugged, rocky beaches, offering visitors a glimpse of unspoilt nature and wildlife. Other scenic features include forested ravines, a swamp forest and splashing waterfalls (including one of the few in the entire world that falls straight into the sea). This 7 720 ha coastal reserve consists mostly of open grassland dissected by perenial streams and flanked by the magnificent forested ravines of the Msikaba and Mtentu rivers. Grasslands cover a large portion of the reserve and support a fascinating and diverse flora. Large numbers of grazing herbivores such as Eland, Red Hartebeest, Blue Wildebeest, Blesbuck and even Gemsbok, have been introduced into the grasslands, although only the first two species are indigenous to the area. Among the birds which may be seen in this habitat are Redshouldered Widow, Yellowthroated Longclaw, Common Waxbill and Croaking Cisticola, with Gurney's Sugarbird and Greater Double Collared Sunbird seeking nectar from the flowering strelitzias. Of the many streams running through the reserve, the Mkambati is perhaps the most beautiful with its crystal clear pools and series of spectacular waterfalls. The Horseshoe Falls are most impressive as they drop down over the terrace in a wide arc, the stream then tumbling over another waterfall before dropping several metres into the ocean. 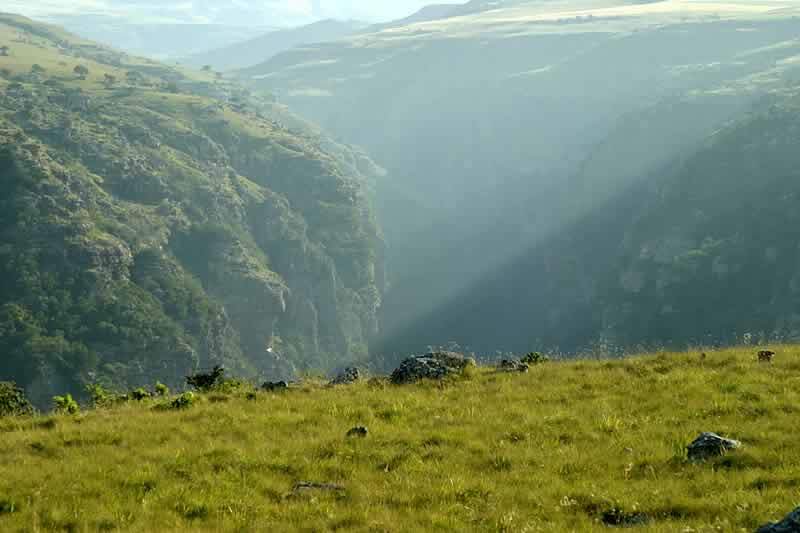 Breathtaking views of the Msikaba gorge can be obtained by walking through the grassland above the river. At a bend in the gorge, a natural amphitheatre of towering evergreen forest is inhabited by a spectacular variety of birds including Trumpeter Hornbill, Rameron Pigeon and many more. Visitors wishing to acquaint themselves with this mysterious river can engage in a 2km canoe trip upstream. Along the way they may be rewarded by sights of the feathery-leaved Mkambati palm, the African fish eagle or the crowned eagle. Birdlife in the reserve is prolific. Apart from canoeing and fishing, there is a variety of trails, one of the most popular being the walk along the Mkambati River to the breathtaking Horseshoe Falls which plunge into the sea far below. Of historical importance (and tourist interest) are two famous shipwrecks, namely the Sao Bento(1554)- near the mouth of the Msikaba River - and the Grosvenor (1782) lying in Lambasi Bay. 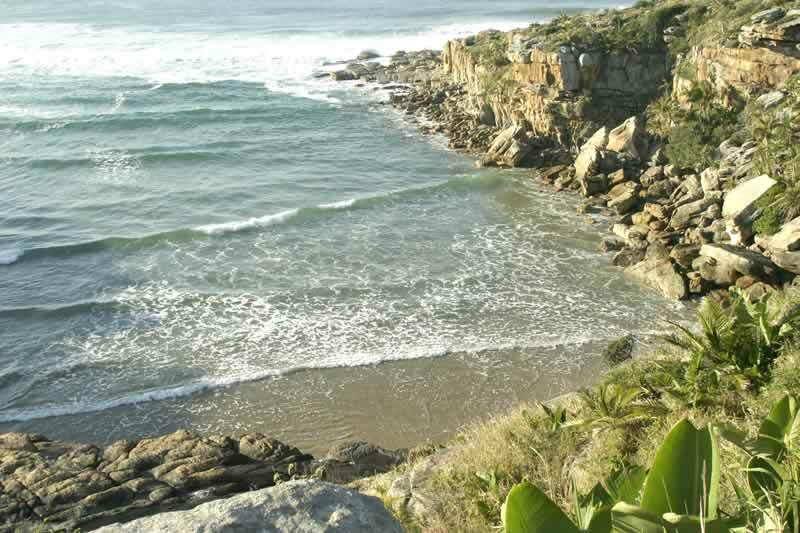 Combine the tranquility of a nature reserve with the natural beauty of the Wild Coast beaches. The reserve offers accommodation in cottages, rondavels and a lodge. 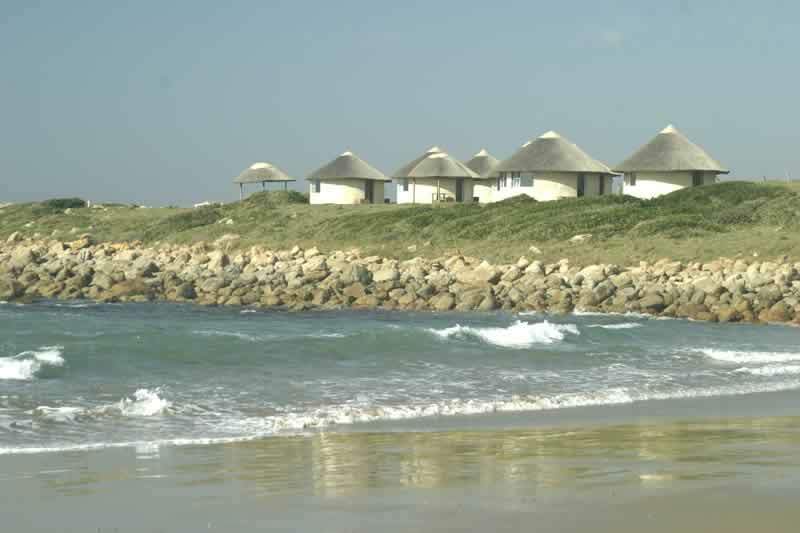 Gwegwe has several rondavels, each with en-suite and kitchen facilities; Point Cottage is right on the beach, sleeps around 8 persons and is ideal for a large family or a group of friends, and the Lagoon Lodge can sleep parties of up to 20 persons. The Mkhambati Nature Reserve has lots to offer the nature tourist. Its long coastline makes for a wide choice of hikes.The large wilderness area can only be traversed on foot. You can self-drive during the day and night to watch the ample game that are featured in the reserve. Fisherman can enjoy fishing at official estuaries. For larger groups, the Gwe Gwe River Lodge (20 persons) and the Main Lodge (10 persons) offers fantastic settings that one cannot help but enjoy, while smaller groups can find accommodation in the Gwe Gwe Rondavels (2 persons), Point Cottage (4 persons) and the cottages near the reception area. Among the birds which may be seen in this habitat are the Redshouldered Window, Yellow throated Longclaw, Common Waxbill, Croaking Cisticola, Orange Throated Long-Claw, Ground Hornbill with Gurneys Sugarbird and the Greater Double Collared Sunbird, seeking nectar from the flowering strelitzias. 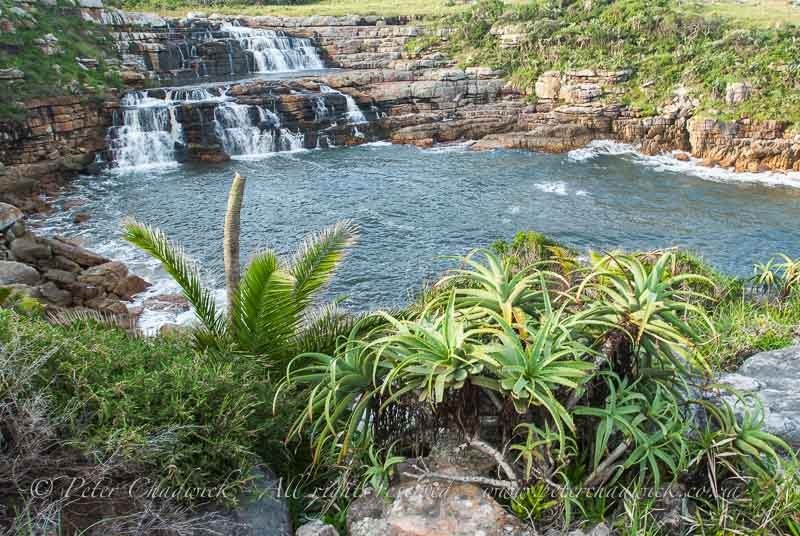 Of the many rivers running through the reserve, the Mkhambathi is perhaps the most beautiful with its crystal clear pools and series of spectacular waterfalls. The Horseshoe Falls are incredibly impressive as they plunge over the terrace in a wide arc. Further down, the river tumbles over the Strandloper and Mkhambathi Falls before dropping several metres into the ocean. Visitors to the Eastern Cape will find the scenic Mkhambathi Nature Reserve one of the highlights of their trips. The climate at Mkhambathi is mild sub-tropical with a relatively high humidity. The warm Agulhas current provides for minimal differences between minimum and maximum daily temperatures. Most of the rain falls falling during spring and summer (September to February). On average June is the driest month, and March is the wettest. Strong winds can occur , blowing parallel to the coast. These winds impact significantly on coastal vegetation and on marine recreational activities. 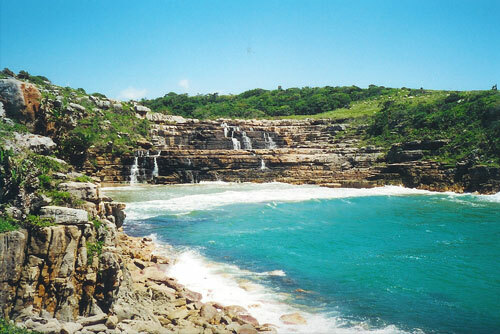 The Mkambati Nature Reserve is situated on the coast of north-east Pondoland in the Eastern Cape. Continue for another 7km, then turn left towards Bizana. After about 36km turn right at Magusheni onto the R61 to Flagstaff. A few kilometres before Flagstaff, look out for a signpost to Mkambati. This gravel road will take you past the Holy Cross hospital to the reserve? ?s entrance gate.